Washing Capitals T.J. Oshie watches his shot on the back nine at Schaffer’s Mill Golf & Lake Club on Monday, July 9. When Washington Capitals right wing T.J. Oshie noticed the only item up for bid from his team’s Stanley Cup winning season was an autographed hockey puck, he and his wife knew they had to do more to help raise funds at the silent auction during Sunday night’s Gene Upshaw Memorial Golf Classic Pairings Party. The auction, held at the Ritz-Carlton Lake Tahoe as part of the annual Pairings Party, helps raise funds for local health programs and research. At the party, Oshie and a couple dozen former athletes and celebrities were paired with foursomes of individuals who purchased tickets for a round with a celebrity player at Schaffer’s Mill Golf & Lake Club. But what the NHL champion did next stole the show, offering up a Capitals jersey signed by each player from this year’s championship team. “I’m not a memorabilia guy,” said Oshie on the gesture. “I played in the Olympics, and I didn’t even get my jersey signed by that whole team or a stick or anything. Oshie said he had 10 jerseys signed with about half already destined for family members. The donation would inspire an impromptu live auction for the item, which started slowly before building into a bidding war. “It started out at $1,000. We were all a little nervous. Then it got up to $1,500 and we were thinking, ‘Ok, we were hoping for more.’ Then all of a sudden people started bidding. The crowd went crazy and the winning bid was $12,000,” said Director of Fund Development Martha Simon. The jersey would bring in the highest bid of the night, according to Simon, helping send the total raised at the party to more than $70,000. “For me it seems pretty surreal with some of the caliber athletes that we have and some of the things we had in the silent auction. I was happy to help out, but for that to go up to $12,000, it’s pretty special,” said Oshie. After this year’s 10th annual Gene Upshaw Memorial Golf Classic is completed on Monday, the event will have raised more that $1.5 million. 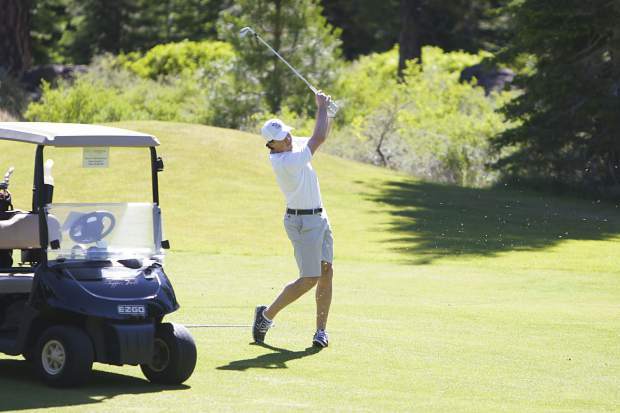 Oshie will head across the lake after Monday’s round at Schaffer’s Mill, playing for the second year in a row at the annual American Century Celebrity Golf Championship at Edgewood Tahoe. From there he’ll continue celebrating the Washington Capitals’ first Stanley Cup, stating that when he gets his turn with the cup later in the month, he wants to return to his high school in Warroad, Minn. Famously, each player from that year’s NHL championship team gets a turn with the cup, which has led to the trophy being used for everything from a giant goblet at nightclubs to last season when Pittsburgh Penguins forward Josh Archibald had his son baptized in it. The cup was most recently spotted with Capitals captain Alexander Ovechkin during this year’s FIFA World Cup in Russia.